Beats of dhol, the sound of the trumpet, bright yellow lights and fireworks, royal chariots and white horses, heavy saris of women and high spirits of men dancing like there is no tomorrow. Ah! Season of Indian weddings is finally here. The most lively part of a wedding is the baraat. And what makes a baraat so much fun, is a band. No Indian wedding, especially a North Indian one can be complete without a band. They add a spark and bring exuberant joy to the weddings. In Delhi alone are hundreds of brass bands. We thus compile a list of the best bands in the city. 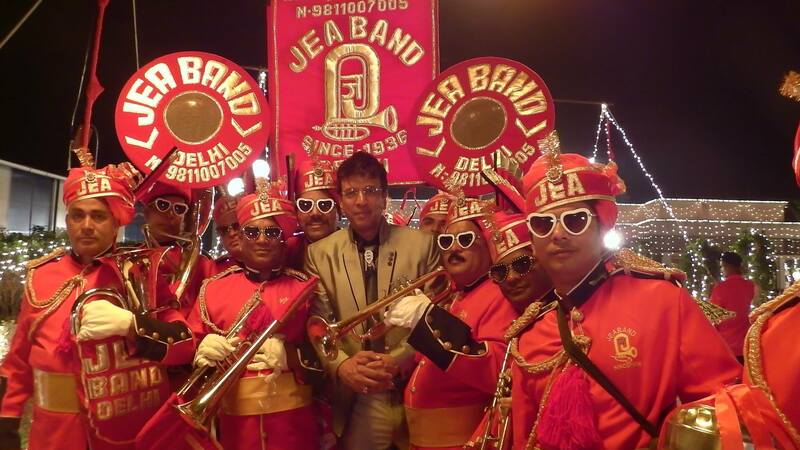 One of the most popular bands of Delhi which has been in the business since 1973. Renowned for its unique style of music and stylish bandsmen, Chawla Band creates a class in every baraat they go to. They were also the official partners for Delhi Daredevils in IPL from season 5 to season 7. Besides the harmonious music they also provide decorated ghori, baggi and palki along with astounding lights and firecrackers. Serving weddings since 1936, they define themselves as baraat makers. The Hindu Jea Band played at the much talked about wedding of Bollywood actors Aishwarya Rai and Abhishek Bachchan, Vivek Oberoi as well as at the Indian Premier League and Commonwealth Games 2010. From baraats to doli, from bagpipers to jhankars to latest instruments, from folk dancers to bhangra, from lal dupatta to munni sheela they have it all. The band surely makes memorable for everyone, whenever and wherever they go. The band claims itself to be the best in the city for traditional and royal weddings. The band has been performing in weddings and other high-profile events since past 50 years.It consists of more than 200 highly trained professionals playing a wide range of musical instruments like trumpets, saxophones, dhols, clarinets, trombones, and other traditional Indian leather or fiber-based rhythm instruments and percussions. Let’s recall the tunes of famous Indian wedding movie—Band Baaja Baraat, where this band got featured. The band has also been featured in Kil Dil and T.V shows like India’s Got Talent and MTV Indi-music. Quality being their motive, the band keeps a royal standard in the wedding industry. They put their heart and soul to make a wedding successful by providing quality services in your budget. They are well-known service providers offering Wedding Band, Wedding Chariot, Fancy Lighting, Chariot, Punjab Dhol and Bhangra Party, Shennai, Tasha Traditional Music (Nagara), Wedding Horse, Band and Music Arrangements for weddings and other occasions. They believe in spreading happiness through their professional approach in services. The band thus wins over the heart of its clients and is widely appreciated. We bet that there is no chance that you haven’t seen the banner of Asha Band during the wedding season. What makes this band the most preferred one by the Delhi- walas is its affordability along with quality. Their well-groomed musicians have an expertise of playing at the wedding processions since past few decades. The name itself explains the royalty. “Delhi ka Maharaja” helps people celebrate the wedding without any hassle. All the professionals you need for a wedding are in this bands team. These experts along with good music and ghodis also provide caterers, furniture vendors, mehendi walas, furniture vendors and cabs even at the last minute. 5 best designer jewellery stores in town that you gotta visit right away!